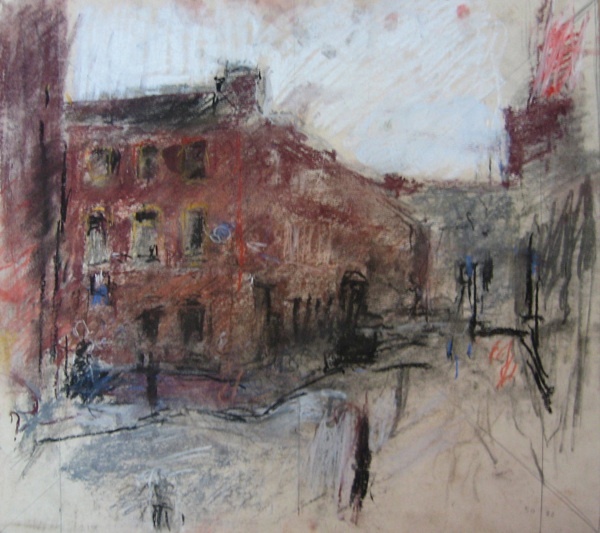 Come and see Anthony Eyton’s pictures of Spitalfields at The Artists of Spitalfields Life opening at Ben Pentreath Ltd on Wednesday 7th November. 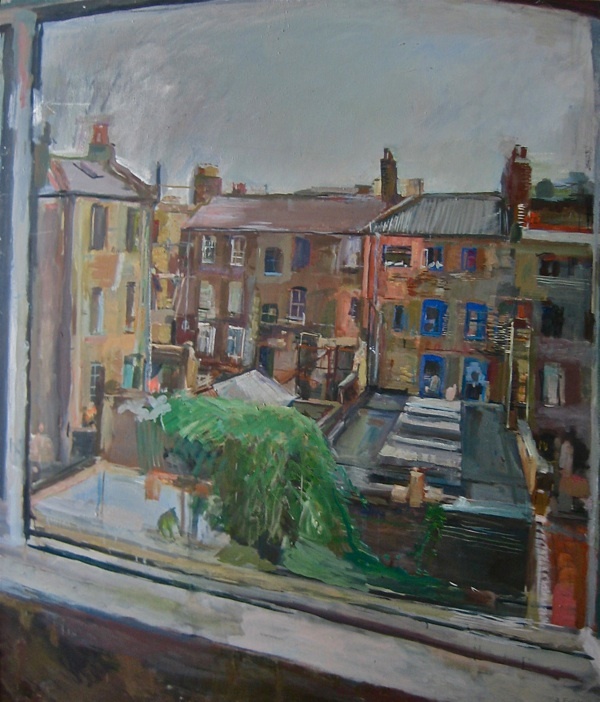 I took the 133 bus from Liverpool St Station, travelling down South of the river to visit the eighty-eight year old painter Anthony Eyton at the elegant terrace in the Brixton Rd where has lived since 1960 – apart from a creative sojourn in Spitalfields, where he kept a studio from 1968 until 1982. It was the 133 bus that stops outside his house which brought Anthony to Spitalfields, and at first he took it every day to get to his studio. 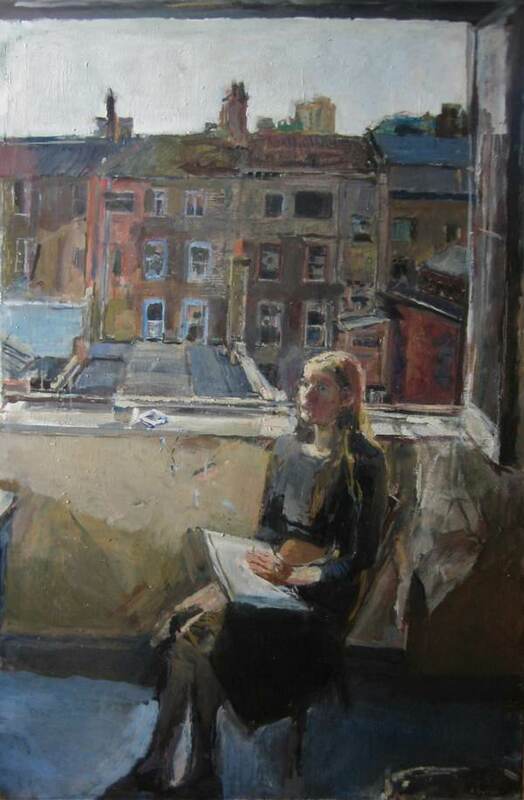 But then later, he forsook home comforts to live a bohemian existence in his garret in Hanbury St and the result was an inspired collection of paintings which exist today as testament to the particular vision Anthony found in Spitalfields. 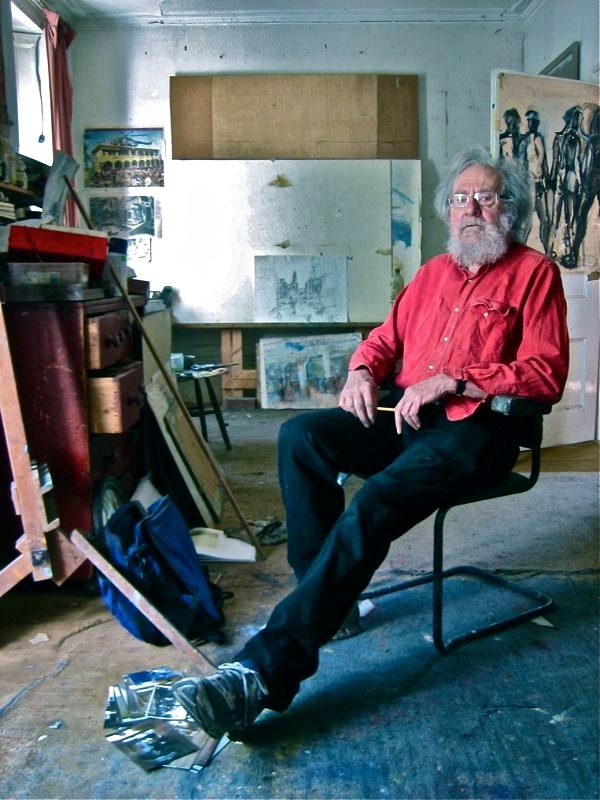 A tall man with of mane of wiry white hair and gentle curious eyes, possessing a benign manner and natural lightness of tone, Anthony still carries a buoyant energy and enthusiasm for painting. I found him working to finish a new picture for submission to the Royal Academy before five o’clock that afternoon. Yet once I arrived off the 133, he took little persuasion to lay aside his preoccupation of the moment and talk to me about that significant destination at the other end of the bus route. 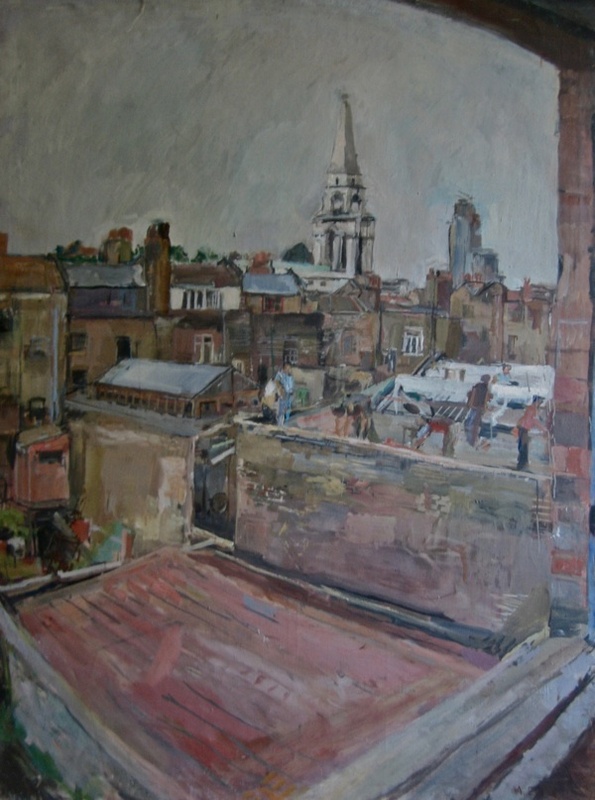 “That biggest strangest world, that whirlpool at Spitalfields, and all the several colours of the sweatshops, and the other colours of the degradation and of the beautiful antique houses derelict – I think the quality of colour was what struck me most.” replied Anthony almost in a whisper, when I asked him what drew him to Spitalfields, before he launched into a spontaneous flowing monologue evoking the imaginative universe that he found so magnetically appealing. Many years before he took a studio in Spitalfields, Anthony came to the Whitechapel Gallery to visit the memorial exhibition for Mark Gertler in 1949, another artist who also once had a studio in an old house in one of the streets leading off the market place. “Synagogues, warehouses, and Hawksmoor’s huge Christ Church, locked but standing out mightily in Commercial St, tramps eating by the gravestones in the damp church yard. 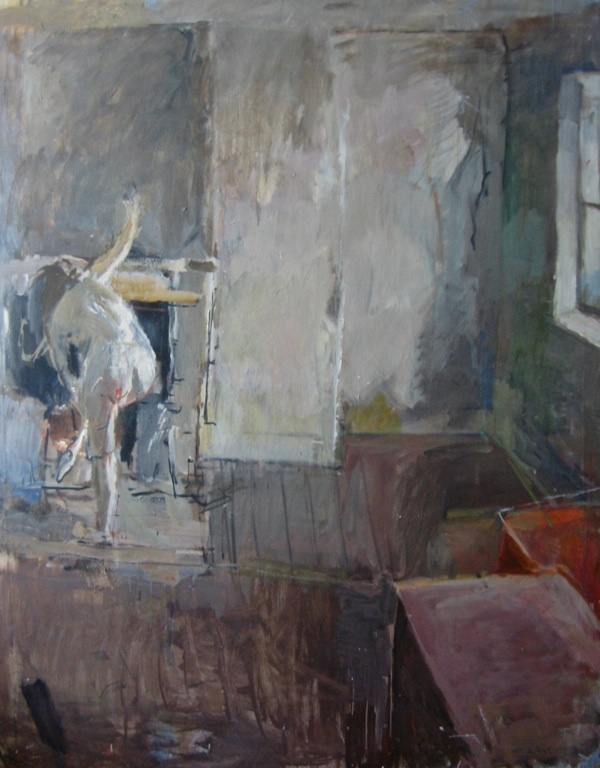 “Touch” was the word that recurred,” wrote Anthony in his diary at that time, revealing the early fascination that was eventually to lead him back, to rent a loft in an eighteenth century house in Wilkes St and then subsequently to a weavers’ attic round the corner in Hanbury St where the paintings you see below were painted. Each of these modest spaces were built as workplaces with lines of casements on either side to permit maximum light, required for weaving. 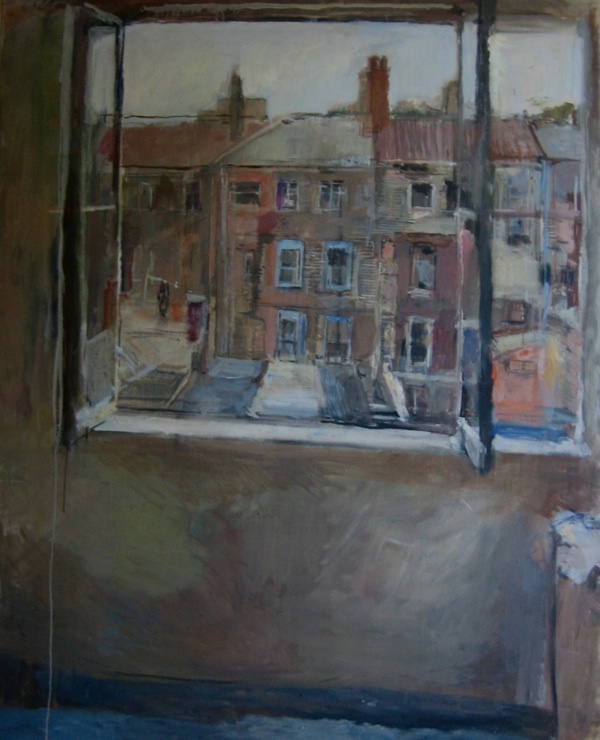 Affording vertiginous views down into the quiet haven of yards between the streets where daylight bounces and reflects among high walls, these unique circumstances create the unmistakable quality of light that both infuses and characterises Anthony Eyton’s pictures which he painted in his years there. 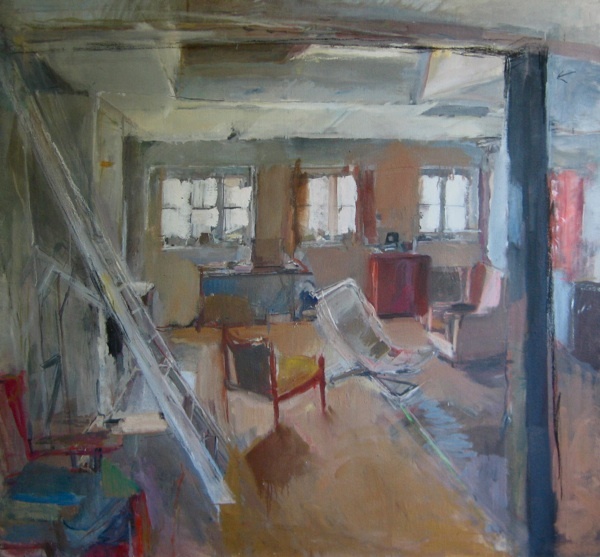 But while the light articulates the visual vocabulary of these paintings, in their subtle tones drawn from the buildings, they record elusive moments of change within a mutable space, whether the instant when a model warms herself at the fire or workmen swarm onto the roof, or simply the pregnant moment incarnated by so many open windows beneath an English sky. 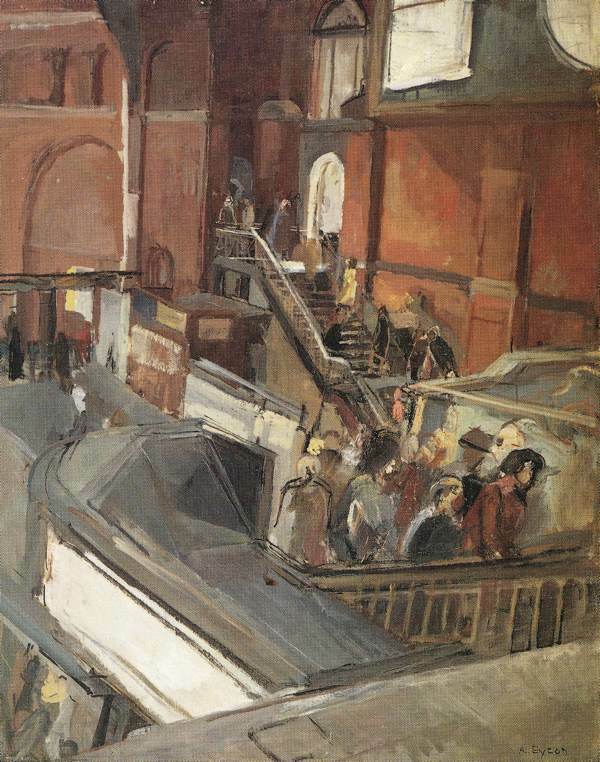 For a few years in the midst of his long career, Spitalfields gave Anthony Eyton a refuge where he could find peace and a place packed with visual stimuli – and then two years ago, a quarter of a century after he left, Anthony returned. Frances Milat who was born and lived in the house in Hanbury St came back from Australia to stage a reunion of all the tenants from long ago. 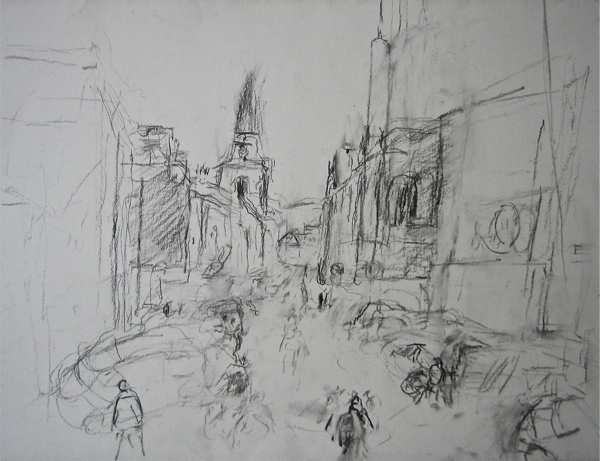 It was the catalyst for a set of circumstances which prompted Anthony to revisit and do new drawings in these narrow streets which, over all this time, have become inextricable with his identity as an artist. Girl by the fire, 1978. 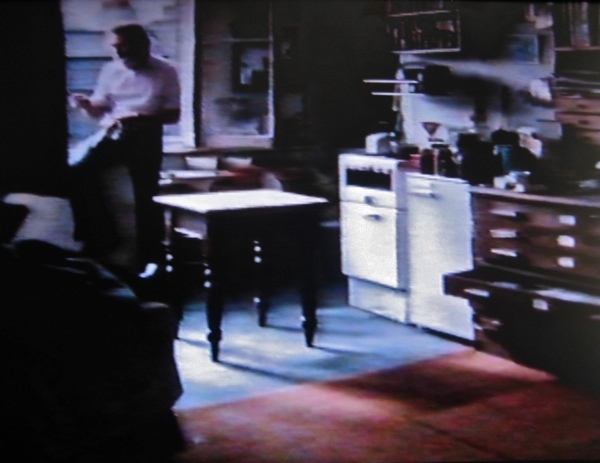 Anthony Eyton working in his Hanbury St studio, a still from a television documentary of 1980. Watch a film of Anthony Eyton in his extraordinary garden here. Would be interested to know if the television programme still exists in some form?